A few weeks ago, a friend sent me links to articles about how pensions are impacting the solvency of Detroit and Chicago. While the obligation to honor pensions – like paying the mortgage on a devalued house – could be perceived as a burden on city, state, and federal governments, each pension is associated with a person. Labeling pensions as the culprits solely responsible for jeopardizing the financial health of municipalities is akin to discarding the contributions of the people who earned them. Many people who choose to be government workers – teachers, firefighters, police, clerks, judges, maintenance workers, administrators, and much-appreciated snow plow drivers (especially in Boston) – do so because they recognize the trade-off between earning less in exchange for contributing to and receiving a pension. Ten or so years ago, working for the government provided stability and good benefits. My husband’s grandfather, mother, father, step-father all worked for the City of Los Angeles or the Los Angeles Police Department. They worked hard, receiving pensions when they retired. Similarly, my mother worked for the City of Burbank. Pensions aren’t entitlements. They offer the promise of being able to retire without the worry of ending up as a greeter at Wal-Mart or asking people if they want fries with their hamburgers. They’re the rewards for working in fields that can be dangerous, physically exhausting or highly stressful. They’re also not limited to government workers. My grandfather worked for Lockheed, and retired with a pension, enabling him and his wife to travel and comfortably live in their cozy Burbank, California bungalow until they passed away in their 90’s. Stories abound of companies mismanaging their pension funds, and subsequently not being able to meet their obligation of paying out retirement benefits. Other companies saw the value of their pensions drop because of investment decisions. For instance, Portland General Electric, Oregon’s largest utility, was acquired by Texas-based Enron. When Enron collapsed employees not only lost millions in savings, but the dream of retirement. An article appeared in the March 2015 AARP Bulletin about the decline in pensions, and how payments are being cut or sold to third-parties as annuities. Stores are emerging of retirees who are being asking to repay overpayments, resulting from accounting errors on the part of pension administrators. The article showcased the plight of an Illinois Sheet Metal Worker whose pension fund had erroneously overpaid him and 588 others, starting in 1974. He was told he had three weeks to repay $66,000 or face steep cuts to future payments. Not only was his pension reduced from $1,300 per month to $800, but he was expected to repay $97,000 along with 7.25 percent interest, the amount overpaid to him over the course of nearly twenty years. Another man, a New York City transit worker, had all but $5 per month of his pension applied towards recouping the monies paid toward him for the past 22 years. Evidentially, he wasn’t supposed to receive his pension because he was receiving worker’ compensation payment, after being shot and stabbed while on the job. According to the article, in the early 1990’s, around 35 percent of American workers in the private sector were contributing to traditional pension plans. Today, just 16 percent can count of having a pension when they retire. The passage of legislation in December, 2014 enables multiemployer plans to cut benefits to people under age 80. These plans primarily cover union workers or those in single or related industries. It’s estimated 1.5 million people are currently covered by these plans, which for many, and their surviving spouses is what depend on for basic housing, food, medication, and other necessities. Pinning Detroit’s and Chicago’s fiscal challenges on having to honor pension payouts is akin to blaming a heart attack wholly on a person’s weight, without considering their diet, lifestyle, gender, and heredity. There is a bounty of images and articles, showing and describing blocks of abandoned houses and businesses in Detroit, resulting from the dramatic decrease in population. 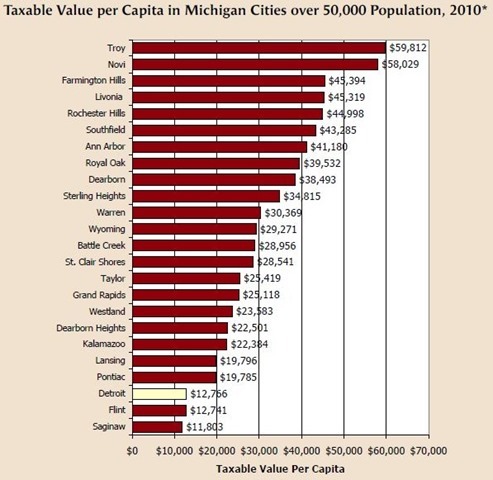 As a result, property values have plummeted in Detroit, which now has the third lowest taxable value per capita of all Michigan Cities over 50,000 people. Only Flint and Saginaw are lower. Not only are there fewer people paying property taxes, because of the massive exodus from Detroit, but the taxable value of properties has fallen. Individuals and businesses are often at odds with the tax assessors, disputing how much they own on particles of land and structures, which have lost most of their value and can’t be sold at any price. A decade ago, there was an estimated 81,754 vacant houses in Detroit. By 2008, that number had climbed to around 102,000 or nearly 28% of all residences. The average price of a house sold in 2003 was $97,847. In six years, the value dropped 87% to just $12,439. A couple of years ago, I wrote about the decline in the value of houses in Cleveland, noting the large number that had gone into foreclosure, and how a pair of Jimmy Choo shoes, Valentino dress, and Gucci bag cost more than a 3-bedroom house in East Cleveland! Nevertheless, in cities like Detroit and Cleveland, reduced tax revenues are expected to cover the same infrastructures, services, administrations, and pension when populations soared in the 1950’s. A drop in economies doesn’t translated to a reduction in the need to maintain streets, bridges, buildings, transit systems, police, fire, courts, public lighting, and other community services such as libraries and recreational centers. Preaching the conservative anthem that reducing corporate taxes, eliminating regulations, and reducing government spending doesn’t appear to be the answer to Detroit’s and other large cities’ issues. It certainly hasn’t translated into job creation and economic growth. 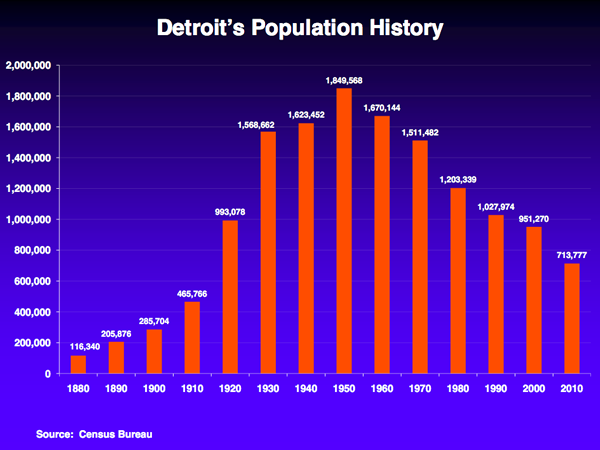 From 2003 to 2012, the City of Detroit cut employment by 9,400 people, a 45% decrease. The Detroit Public Schools followed suit, reducing employment by 58% over the course of 9 years. As a result, nearly 24,500 people lost their jobs, benefits, and most likely, the ability to one day retire with a pension. How did the public sector respond? The Detroit Medical Center, Henry Ford Health System, and St. Johns Providence Health System are three of the largest employers in the area with a combined employment of 24,940 in 2009. In the subsequent 9 years, they’ve reduced employment by 1,337, which is an acceptable 5% reduction, conceivably the result of increased efficiencies of healthcare deliveries and fewer people seeking care. 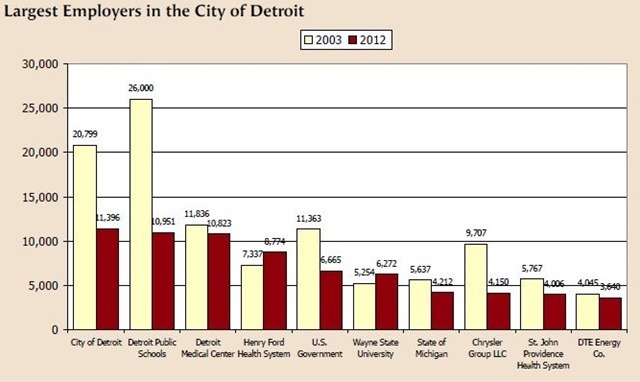 The next largest private sector employer in Detroit was Chrysler with 9,707 employees in 2003. They reduced employment by 57% to just 4,00 6 employees in 2012. The nearly 30,500 people who lost their jobs, between 2003 and 2012, having formerly worked for the City of Detroit, Detroit Public Schools, or Chrysler are a subset of the massive job loss and economic decline in Detroit. Those who didn’t flee the city in search of other opportunities, found themselves with reduced earning power. 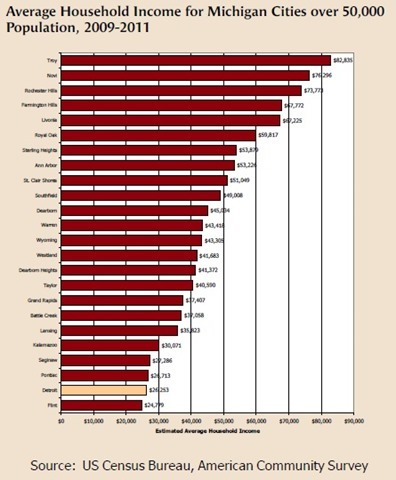 Only Flint has a lower average household income than Detroit, where the average household income is just $26,253. With many of Detroit’s resident having low incomes, the demand for services is high from transportation to health care, food programs, and housing. When the topic of pensions arises, much of the focus is on people who need it the most, hard-working city and utility workers, teachers, firefighters, police, clerks, and those in trades and unions. For many of these people, their salaries didn’t afford them the luxury of socking away a sizable nest egg. Or maybe they didn’t envision their pensions could be reduced or eliminated. There’s another side to pensions. Consider the pensions made available to members of congress. A congressman who is 62 years of age, can collect a full pension after serving just five years. Five years. If they were elected when they were 30, they can collect their pension when they turn 50. The base pay for member of Congress is $174,000. Nearly half are millionaires, and the remaining aren’t doing too poorly. Fifty-five members have an average calculated wealth of $10 million. Obviously, few if any of these people need a pension. Yet, little is said about the silver spoon they’re bestowed in salaries, benefits, and pensions when they get elected. Case in point, Republican Congressman “Downton Abbey,” Aaron Schock, who served just 8 years will be eligible, when he turns 62, to collect hundreds of thousands of dollars in taxpayer-funded retirement benefits. Nevertheless, Schock and other elected officials are the ones pointing fingers at the city janitor who barely earned more than $30,000 per year, and now with arthritis from 30 years of physical labor, is hoping to collect a humble pension that will enable him to live in a two-bedroom apartment, and purchase groceries and medications when needed. Other pension programs, which aren’t widely critiqued are those offered to members of the military. No doubt, serving in the armed forces is stressful, demanding, and dangerous, especially if you’re serving in combat. However, in the past 15 years, military retirement costs have skyrocketed more than six-fold to an estimated $18.3 billion, which will be paid to military retirees in 2015. Costs are high because military pensions are at least twice as generous as the best private sector retirement plans, and officers and enlisted men can retire at half of basic pay after only 20 years’ service. The typical nondisabled military retiree receives an annuity of $13, 226 which is fully indexed for inflation. Since the average retiree begins collecting these payments at age 43, he has plenty of opportunity to supplement them with second career private earnings and, eventually, Social Security benefits and even a second pension. Returning to my original premise. Every pension is associated with a person. Generalizing that pensions cost too much and jeopardize the financial health of a city, state, business or trade sounds good until you consider the impact to recipients. What type of society are we if we deny or severely cut someone’s pension who’s been toiling for 20, 30, 40 or more years? Someone who light at the end of the tunnel is the security of knowing they’ll have enough money to slow down, read the books that have been piling up on their shelves, spend more time with family, travel, sleep-in, take long walks, knowing they have nowhere they need to be, and enjoy what’s left of their lives without the worry of not having enough money for basic necessities. Invocation #39: Who is Mighty? It is written: Who is mighty? He who turns an enemy into a friend. Not by flattery. Insincerity gives the lie to good intentions. Not by silver coin. Who can be bought once can be bought twice. Not by promises one cannot keep. Nor by bestowing favors one will not repeat. But by extending a hand in friendship, with motives pure and undemanding. By listening to grievance and paying heed. By being forgiving, even if not forgetting. O Lord, mighty is the enemy, mightier still is the friend, but mightiest of all is the enemy who becomes the friend. “Motives pure and undemanding” exemplifies two meals Rich and I shared last week. Neither one was originally script to be memorable, but they left indelible impressions not for the excellence of the food, but the people who played roles. The first meal was a dinner last Monday night with Rich’s sister, Georgene and her boyfriend, Pat. They’d met in their teens when they both worked at a McDonald’s in Anaheim, California. I don’t know how long they stayed together, but for they took separate paths as adults, marrying, having children, engaging in careers, divorcing, and reconnecting a dozen or so years ago. In January, Rich had lunch with Georgene and their brother, Ralph having not seen her for over ten years, and speaking infrequently by phone or via email. I hadn’t seen her since around 2003, and had met Pat briefly in the same timeframe. On Monday evening, we drove to the Red Hook Brewery for dinner. Shortly after we’d arrived, Pat shared that in his early twenties, he went to dinner with his boss who paid for the meal. The occasion made a huge impression on him. Afterwards, he resolved to make enough money to be able to afford to take people to dinner and pay for his meals. He concluded by saying that’s what he truly wanted to achieve in life. His story was fleetingly acknowledged before he launched into another subject. Like a notch in a wheel, throughout the evening, my mind kept wandering back to what he’d said. When we returned home, I commented to Rich about Pat’s life objective to earn enough money to treat people to dinner. Rich was equally enthralled with Pat’s selflessly, generosity, and benevolence. Many people, who yearn to earn lots of money, imagine spending it on travel, houses, cars, and other material items. Pat, however, sees money not as a way to get “more stuff,” but share with others. What makes his life objective even more astonishing is that Pat is extremely successful. His business has branches around the world! Our second memorable meal of the week took place on Saturday morning. Whenever there are coupons for McDonald’s, Denny’s or other national chain, which arrive in the mail or newspaper inserts, Rich skededabbles to an apartment complex within walking distance of our Kirkland house. He shuffles through the trashcan by the complex’s mailboxes where resident chuck the mail they don’t want… including “valuable” coupons. Most of the coupons we leave on the “free” table where I work, or give to other people. On Saturday, morning, with coupon in hand, we had breakfast at Denny’s. After ordering, Rich walked around giving coupons to other diners, including a family with two kids. Towards the end of our meal, the father approached our table, thanking us for giving him the coupon. I replied that it was our pleasure. Then the man said he paid for our meal. Rich and I were speechless. Twice last week, we experiences “motives pure and undemanding” and the true meaning of friendship and goodwill.